Perfect location at the harbor. Dinner and breakfast included for $115 US. Closing for 8 months for refurbishment. Dinner ok, breakfast awesome. Soul restaurant next door is run by a a family from Chieti, Italy. Best pizza I have had outside Italy. Pleasant staff. The location is good, the food was reasonably and the hotel clean. The receptionist was really professional and nice and efficient! Exceptional service and very friendly staff. Food was delicious! Hotel has very good location, close to the beach. Location, location, location. I was upgraded to a double room with balcony overlooking the beach even though I was alone and had booked a single room. Loved walking the coastal path leading to Ciudad Jardin about 4 km. away. Beach near hotel is fairly clean if you get there in the morning. Airport is a short bus ride away (bus nr. 21 for 5 Euro). Pool a little small but knew that when booking.we all thought the food was excellent. Hotel Las Arenas This rating is a reflection of how the property compares to the industry standard when it comes to price, facilities and services available. It's based on a self-evaluation by the property. Use this rating to help choose your stay! Set overlooking the sea, this hotel is only a short walk away from Ca’n Pastilla beach. 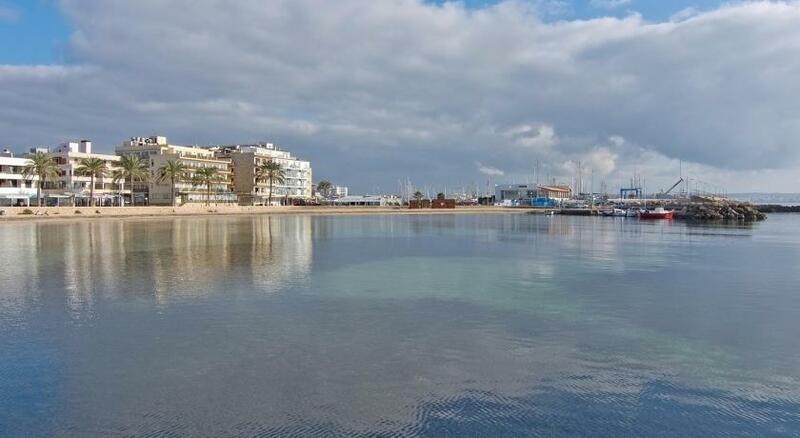 It is only 350 feet from the bus stop that takes you to Palma city center. Palma Airport is 5 minutes' drive away. Hotel Las Arenas features an outdoor swimming pool and a terrace bar with sea views. There is also a buffet restaurant, and a lounge bar with music and shows. Las Arenas hotel is the ideal place to enjoy a holiday on the beach and in the Majorcan sunshine. From here you can also easily get to a variety of shops, and bars. Alternatively, the center of Palma de Mallorca, the capital of the island is just a short bus ride away. There you can find numerous excellent bars, and a lively nightlife. When would you like to stay at Hotel Las Arenas? This air-conditioned room features a balcony and modern decor. It includes a minibar, safe and private bathroom. This air-conditioned room features a balcony with sea views and modern decor. It includes a minibar, safe and private bathroom. House Rules Hotel Las Arenas takes special requests – add in the next step! Hotel Las Arenas accepts these cards and reserves the right to temporarily hold an amount prior to arrival. Please note that reservations of 10 rooms or more are subject to special conditions. Contact the accommodations for further information. Please note that children of any age are allowed in Single Rooms. There was nothing not to like about this hotel. coffee from the coffee machine at breakfast was foul but there were plenty of nice cafes nearby. The room was on the top floor, roof level. It was very very warm even with the air-conditioning running. The air-conditioning went off when you took your key card out with you. The balcony/roof top terrace door wouldn't lock on arrival so posed a security risk due to access from other rooms on the same floor. The pool area was very small and had hardly any sun loungers. There was no hand sanitizer to use before you went in the restaurant. The hotel is spotless and the staff very friendly. There was a good choice of food. Single bed and mattress were not comfortable at all. Air con was poor and working very slowly : it was turned off every time I left the room with the key and it took hours when I got back to cool the room: really not comfortable either !! Food at buffet looked good, but I only ate vegetables and fruit since I am afraid to get sick from fish, chicken and meat at buffets in a hot climate. I would have liked to eat more, but wasn`t sure that the food was fresh and recently prepared. Maybe it was fine but I wasn`t willing to take the chance.